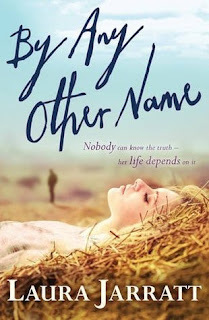 I really loved By Any Other Name by Laura Jarratt. I had high expectations for it after reading Laura's Jarratt previous (and also standalone) book last year, Skin Deep. I love especially how both books deal with identity in different ways. Jarratt is quickly becoming one of my favourite authors due to her wonderful characters, interesting stories and beautiful way of writing. I eageraly await any future books by the same author! I haven't read many books involving witness protection, but I really love the issues that go along with such a premise. There's a tension that arises from keeping something important secret, shutting off the life you led before and the person you once were. Such is the case for 15 year old Holly who had to choose her own name out of a baby book after witnessing a terrible event and being placed in witness protection. There are frequent flashbacks throughout the story that begin to build a clearer picture of what Holly went through and who exactly she is hiding from. By Any Other Name is Holly's story as her and her family move away and start again in another town, in another school. Holly really struggles with who she is in so many different respects. I love how Laura Jarratt plays with identity in this book. Is a person who she is because of her name? Her personality traits? Can she become somebody else by making different choices and taking on different roles? It was interesting seeing how Holly views herself differently because of what other people think of her and her family's circumstances. Other characters show Holly different elements of identity - from a soldier's sense of masculinity being threatened by injuries but also how friendships and family connections are important and shape the choices we make in creating our own identities. And while I absolutely loved and wanted to soak up all of these different aspects of identity, a topic that I love reading about, By Any Other Name also ramps into a really tense thriller as everything that Holly and her family have fled from creep back into their lives in a very dangerous way. While the beginning of the book is a bit slower in pace with it's character-driven storyline, the last third of the book nearly took my breath away with all the action and danger. By Any Other Name is a story that really grabbed me and kept me flying through the pages right from the beginning! I highly recommend that you pick up this book. By Any Other Name sounds a bit like When I was Joe, and I really enjoyed that :) The exploration of identity sounds cool, and I look forward to reading about it myself! Fab review, Michelle. As I was reading it, I was thinking the same comparison. Like When I Was Joe, this book deals with identity really well.